During a break in the action of Monticello’s game vs. Western Albemarle, 2013 graduate Jhalil Mosley was recognized as the leading career scorer in Mustangs boys basketball team history. 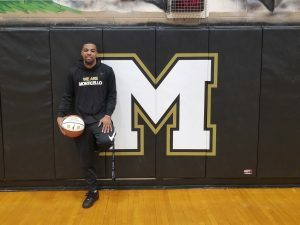 Playing three years of varsity basketball for the Mustangs from 2010-2013 under Head Coaches Kareem Martin and Robert Shelton, Jhalil finished his career with 1,128 points – the highest total in Monticello boys basketball history. During his time at Monticello, the Mustangs appeared in three Region tournaments, twice finishing just one win away from advancing to the State tournament. 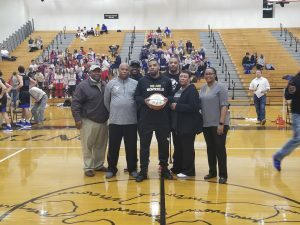 Individually, Jhalil scored 20 or more points 13 times, with a career game-high of 33 points against Barrow Christian in the 2011 Daily Progress Tournament. In addition to basketball, Jhalil played 3 years of varsity football, 2 years of varsity baseball, and 1 year of track & field for the Mustangs. After graduating from Monticello, Jhalil attended the College of William & Mary where he was a member of the Tribe football team. For more information on Monticello boys basketball, contact Head Coach Gary Spry at gspry@k12albemarle.org.